Talk about expensive tastes. This US$1000 Sundae would want to taste pretty good! I know. It sounds crazy: $1,000 for an ice cream sundae? But, the sundae is The Grand Opulence Sundae from famed Serendipity of New York City and it's made up of the best of the best. According to the restaurant, they sell approximately one a month, so apparently, quite a few people have some money to indulge in such opulence. Made with "5 scoops of the richest Tahitian vanilla bean ice cream infused with Madagascar vanilla and covered in 23K edible gold leaf, the sundae is drizzled with the world's most expensive chocolate, Amedei Porceleana, and covered with chunks of rare Chuao chocolate, which is from cocoa beans harvested by the Caribbean Sea on Venezuela's coast. The masterpiece is suffused with exotic candied fruits from Paris, gold dragets, truffles and Marzipan Cherries. It is topped with a tiny glass bowl of Grand Passion Caviar, an exclusive dessert caviar, made of salt-free American Golden caviar, known for its sparkling golden color. It's sweetened and infused with fresh passion fruit, orange and Armagnac. 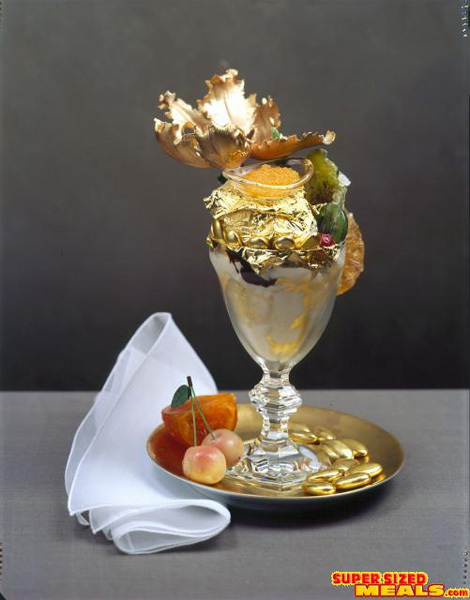 The sundae is served in a baccarat Harcourt crystal goblet with an 18K gold spoon to partake in the indulgenceserved with a petite mother of pearl spoon and topped with a gilded sugar flower by Ron Ben-Israel." Visit Serendipity's website www.serendipity3.com for more information.